Because we believe that education is only possible when there is support in the home, we ask the parents of Deeper Root Academy students to renew their commitment to our Parent Covenant each year. • I accept the school's mission statement, beliefs, and strategies of education that are in accordance with the Word of God and Biblical virtues. • I agree to support the school in upholding its rules and policies as outlined in the Parent/Student Handbook. As a parent, I am responsible for the behavior and actions of my child. I will not undermine the authority of the staff when discussing the discipline with my child/children. • I will support the school in maintaining a high standard of Christian conduct for its students. I acknowledge that should my child/children's behavior, while under the supervision of school personnel, become incompatible with the standards of Deeper Root Academy, normal disciplinary procedure will apply. However, depending upon the severity of the infraction, it may be considered grounds for suspension or expulsion. • I will practice the principle found in Matthew 18, resolving difficulties with school personnel directly. If the conflict is unresolved, I/we will discuss the matter with the next person in authority. The line of authority is as follows: Teacher, Principal, and lastly Executive Director. • I agree to participate in mandatory parent activities, including parent-teacher conferences. • I agree to pay my child's tuition and do so in a timely manner. 1. Making sure my child arrives at Deeper Root Academy daily by the start of school. 2. Making sure my child follows the Deeper Root Academy dress code. I understand that the Deeper Root Academy Parent/Student Handbook is not intended to cover every situation that may arise during the school year, but is a general guide to the goals, policies, and expectations of the academy. Furthermore, I understand the Executive Director and/or Board of Directors have the authority as the administration of the said private school, Deeper Root Academy, to make all decisions regarding the school (facilities, instruction, discipline, curriculum, activities) faculty/staff, students, and enrollment. Failure to adhere to these commitments can cause my child to lose various privileges and can lead to my child's removal from Deeper Root Academy. 1.The Bible is God's truth and reveals the only way to know reality and fulfillment in life. 2. Because each student is created in the image of God with unique physical, social, emotional, intellectual and spiritual gifts, he/she is a valued individual within the community whose primary purpose is to glorify God. 3. The student will model what he/she sees; therefore, by God's grace, all faculty and staff should strive to be Christian role models. 4. A variety of instructional strategies and learning activities should provide appropriate challenges for all DRA students. 5. Aspects of our educational program will be taught from a Biblical perspective. (/Bible/Chapel/Character Ed). 6. The student is personally responsible and accountable for his behavior and personal integrity. 7. The student learns most effectively in a safe, structured, healthy environment. 8. DRA works in partnership with parents/guardians in education, yet the final responsibility for the child's academic and spiritual development is at home. 9. The commitment to continuous school improvement is imperative in order to enable each student to become a confident, self-directed, life-long learner. 10. DRA emphasizes spiritual development and academic excellence as a means to glorify God in a global society. My acknowledgement means I support the educational structure of Deeper Root Academy. I agree with the guidelines set forth in the Deeper Root Academy Student Handbook for the 2019-2020 school year. I agree that I and my student (s) will abide by the policies set forth in this document. I acknowledge that I have received the Student Handbook and accept responsibility for reviewing, understanding and complying with the policies and procedures of Deeper Root Academy. I also recognize that the policies and procedures may change from time to time and accept responsibility for maintaining current and accurate information. • Payments are ONLY accepted via the FACTS Management Program. Tuition is due on the first or the first business day of each month. A Late fee of $25 will be assessed if not received within 48 hours of the due date. • If your account becomes delinquent, and you have not made payment arrangements with the finance department, your child will not be permitted to return to school until full payment is made or may be withdrawn from the academy. • Registration, First Tuition Payment is due in full by August 12, 2019. I/we understand that I am/we are responsible for the payment of Deeper Root Academy services and agree to the terms of the Payment Policy that is enclosed with this application. Failure to follow the payment policy will result in loss of Deeper Root Academy services. 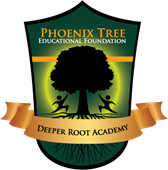 Deeper Root Academy believes a safe and disciplined learning environment is the first requirement of a high performing school. The implementation of school uniforms will help minimize disruptive behavior, promote respect for oneself and others, build school/community spirit, and, more significantly, help to maintain high academic standards. The Board also feels that wearing of uniforms by students will help lessen the impact of socioeconomic differences. In addition, it allows for identification of intruders on campus and encourages students to concentrate on learning rather than on what they are wearing. First Offense: Students shall be informed that they have violated the policy. They shall be given the opportunity to call a parent/guardian to bring clothes. Second Offense: A second infraction of the policy may be considered as defiance. In addition to calling a parent/guardian to bring clothes, a parent/guardian conference may be held. Third (and additional) Offenses: A third or additional infraction of the policy will result in disciplinary action up to in-school suspension. Disciplinary action may vary when a student has a record of other student conduct violations during the current school year. Students who do not comply with the School Uniform and Appearance Policy also may be excluded from participating in certain school programs and activities. I/we give permission to Deeper Root Academy to photograph or video my child(ren) for public relations or marketing purposes.